all sorts of card craft, especially making explosion boxes lately but I think it is really browsing the blog looking at everyone else’s fantastic crafts. I have been too tired after working in the heat the last couple of days to even make some flowers so instead I just decided to browse some of my fave blogs and even thought I would look up some of their fave blogs that I haven’t looked at yet! It is unbelievable the amount of talent there is out there and I just can’t seem to leave the computer. It is almost as though I might miss something if I go away and do something else. Consequently there are a few more links I recommend on my side bar. I just can't list them all. My interests and 'taste' changes and so might my links from time to time too. But today, I am going to discipline myself and show you a couple more of my earlier boxes, since I am up nice and early and church is yet a few hours away before i need to get ready. Then I am going to be super good and finish my latest explosion box. I am getting quite excited by it. It is so different to my earlier work, but more on this in my next post!. Last year I made two explosion boxes nearly the same. 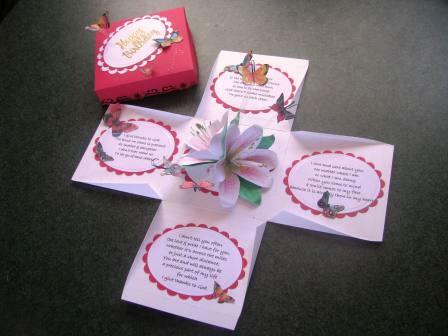 Oriental lilies are the favourite flower of one of my daughters and this inspired me to have a go at designing a flower and thus a box to house it. The flowers were hand cut card which I coloured using sponges & pink ink and a pink art pen to draw on the spots. I then proceeded to roll the petals into shape and glue around the card stamens that I had cut in a quilled style, flaring out the tips and adding a touch of glue & glitter to them. Both boxes had ovals cut using my Nestabilities dies. On Camille’s box I had modified a poem that I found on the net and typed up my version and printed it onto cardstock ensuring that it would fit within the oval before cutting. It wasted a bit more cardstock this way but ensured that it looked a lot neater than so much of my own hand writing would have done. As usual there are butterflies fluttering around. Camille loved her box and I hope you do to. 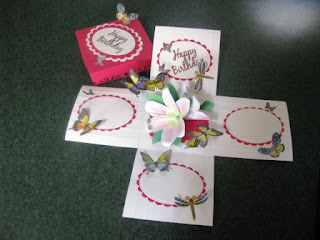 The second one is so close to being a carbon copy but it is generic and made for sale as a Happy Birthday box. The boxes and flowers are time consuming. I really don't know how long it takes me to make one box as I rarely sit down and do anything in one go. Once in a while, I might have a couple of boxes on the go at once. It would save more time but I like making each one different and unique. As I have said previously, I make most of the flowers in the car whilst my husband is driving. As we are currently on a big trip around the centre and western part of Australia, there is a lot of driving involved. One day I will time it one time just for curiosity's sake. Sorry I don't have a close up to show you. I never thought I would have a blog and I just took the photos for my own recollections. I will endeavour to take a closer up view of some of the details in case anyone is interested with all future boxes.One day I might even make up tutorials if people are interested. Thank you for looking. Do leave a comment as I would appreciate some feedback as to what you guys think of my blog and boxes. Suggestions are always welcome too.